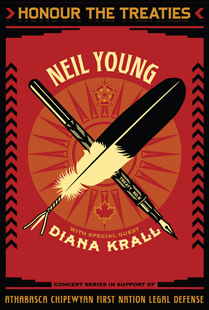 Can’t get tix to Neil Young’s Honour the Treaties concert? Get the music going, then head to your computer where you can learn more about the oil sands and how their development is affecting the local people, plants, animals, and water, not to mention the rest of us here on Earth. Go online and donate to the Athasbasca Chipewyan First Nation Legal Defence Fund, the same fund Neil Young is supporting with his four-concert Honour the Treaties tour. Head over to EcoJustice, an organization that uses the law to protect the environment, to make a donation. EcoJustice just today filed a lawsuit to block approval of the Northern Gateway pipeline, a proposed project that would result in oil sands bitumen being transported across mountainous terrain to Canada’s fragile west coast. Add your name to 350.org’s petition in support of Neil Young and his environmental efforts. Share this post with your friends and family and followers to help spread the word. After all, Canada, there “Comes A Time” when we have to stand up for what’s right! Eh?